The Complete Dancer is a collaboration of Edmonton’s foremost Middle Eastern Dance instructors coming together to share their knowledge of concepts that they are passionate about. We've all seen dancers that captivate us. They have that "something" that sets them apart. We want to see our students grow as dancers and artists, not just able to perform our choreographies but also able to create their own. To have a better understanding of the music they hear so that they can more easily improvise to it. We want our students to become the best Oriental Dancers they can be. Unlike regular classes you will not have the same instructor for the entire term. This term, we have five instructors on board to cover topics that are near and dear to their hearts. Because the course is broken down into modules, if you are unable to make the full term, you are welcome to take the classes as independent workshops. We trust that you will continue to work just as hard in this class. That does not mean that we expect you to be able to do every single thing we throw at you right off the bat! But we do expect that you will put in the effort to improve and ask questions when you need to. Students will be expected to work on course material on their own time as little to no review will be done from class to class. This is not a drill class and it is unlikely that you will learn any new technique in these modules. Instead you will learn theories and concepts - ideas to help you improve your dance. It is expected that students drill technique during their in-home dance practice. We recommend you keep a dance journal. This is a great place to collect your dance info, notes, questions, impressions and to keep track of your progress. We understand that life happens. If you are going to be late for a class, please do try to let us know, if at all possible. When you arrive, please do your best to not disrupt the class. If you are late, please be sure to prepare your body for the work you are about to do by taking a few minutes to warm yourself up. If you have to miss a class, please let the studio or your instructor know. Get your body moving after the holidays with this special dance conditioning class. This class with focus on strength, stamina, and flexibility. We'll cover specific exercises helpful to dancers, all of which you can take home and add to your own routine. Bring a yoga matt, towel, and water bottle. Learn a lyrical, romantic piece with tons of gorgeous arm patterns, this is your chance! You will learn the technique and a short choreo to the beautiful romantic song Ya Dali Ya Rouhi. We all have heard of Oum Kalthoum but who was she and why is her music still so important? This class with combine discussion and a bit of history review with learning how to best translate her songs through your dancing. We will focus on emotional authenticity and tapping into your "heart of hearts" to really explore the depths of her beautiful music. 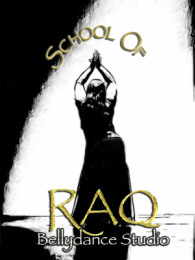 History of Bellydance: You have to know where you come from to know where you are going! This lecture class will review the history of Bellydance in the 20th century, from its roots in the Middle East, to the growth of the dance form in North America. The lecture will include profiles of some of the most influential dancers in history, and also cover significant world events and perspectives that shaped the dance form. A must for all Bellydancers. Please bring a notebook. Learn traditional steps and movements common in Turkish Roma dance, as well as the gestures that make the dance truly unique. We will break down the 9 /8 havasi rhythm and learn how to dance through that “extra” beat. We will work through a few short combinations and movements that can be used in a traditional Roma improvisation or added to your own choreography. Ready to get a little weird? This class isn't a "belly dance class" it's all about movement/energy/intention/focus and how playing with these different aspects of movement can enhance your dance practice and ability. Prepare to get up to get down. Note: all dancers of all styles encouraged to attend. Improvisation isn't always a skill that comes naturally to every dancer. Together, we will work with various exercises to find comfort and familiarity within transitions and build your confidence when you don't have a choreography to follow.